As readers of Historista know, I have been arguing for a while now that the removal of white supremacist memorials provides us with unique opportunities to transform them into socially just and intellectually productive public sites. One of the ways to do this is to appropriate the sculptures themselves – or their empty pedestals. An artistic project currently underway in Philadelphia offers a thoughtful – and doable – option for transforming these pedestals through re-inscription. Monument Lab is a public art and history project produced with Mural Arts Philadelphia. This month, artists have installed prototype monuments by 20 artists throughout Philadelphia; one of them, If They Should Ask, by Sharon Hayes, recreates and groups together nine pedestals from existing monuments in the city. On one, these words have been chiseled – “On this site there could be a statue to” – followed by a list of names of both famous and unsung women in Philadelphia’s long history. The project is interactive; visitors and others can suggest names to add to the monuments on the project website. If They Should Ask is a powerful artwork that calls attention to both presence and absence in the memorial landscape. It would be a fantastic model for local communities thinking about what to do with their white supremacist memorials. 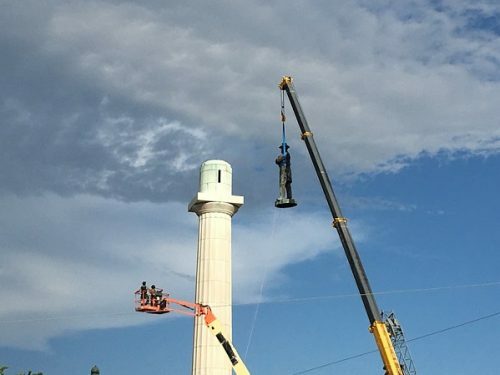 Imagine if the Lee statue pedestal in New Orleans, for example, were re-inscribed with the names of African-American soldiers who served in the 1st Louisiana Native Guard, one of the first black regiments to fight for the Union Army. Or with the names of civil rights activists who fought for social justice in the city. Or both. Communities could choose whether to remove the previous inscriptions – making the pedestal a kind of palimpsest of local histories – or to insert these names alongside the original text, as a direct engagement with what has come before. These transformations would be so much more powerful than hiding monuments away in museums, or affixing them with explanatory plaques. They would engage the historical imagination – as the Monument Lab curators and artists aim to do – and in so doing, work for social change. Featured image: Sharon Hayes, “If They Should Ask” (Philadelphia, 2017). Photo by Steve Weinik, Monument Lab. Thank you for blogging your take on the memorial controversy in the United States.